The Ready-To-Go Lysimeter is a small lysimeter station for soil columns with a surface area up to 0.5 cm² and a length of up to 1 m. Mini-Lysimeters are a widespread method to directly determine the actual evapotranspiration. For sites with a root depth smaller than the depth of the lysimeter vessel the latent heat flux can be measured with high accuracy (also for heterogeneous landscapes) [Grimmond et al., 1992, Parisi et al., 2009]. 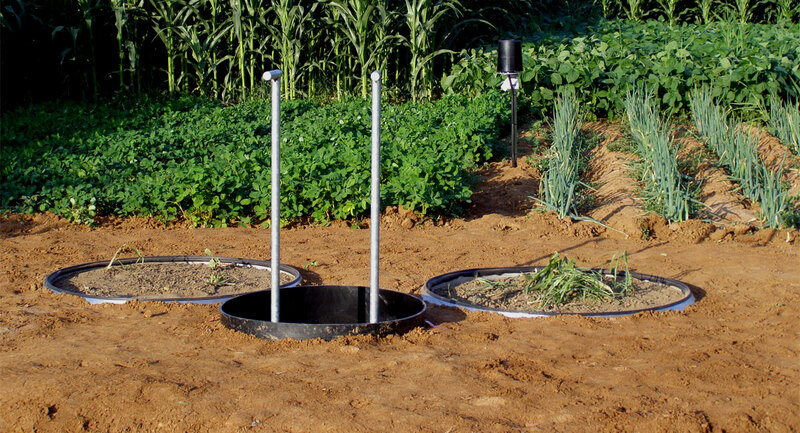 The Ready-To-Go Lysimeter is suitable for both disturbed (filled by hand) and undisturbed (using the patented UGT-Excavation Technology) soil monoliths. The compact lysimeter station consists of a PP lysimeter vessel, a weighing system, a seepage tank with a tipping bucket, a weather station, a set of soil hydrological sensors, and a data logger. The system operates as a plug and play system. The entire station can be erected and put into operation without special tools or specialized staff. It is a cost-effective alternative lysimeter system to observe water transport processes under natural conditions. Up to four Ready-To-Go Lysimeters can be connected to one data logger. Combining the data logger with the SVADSS box or with a remote data transmission provides a quick and easy access to the data via the internet. The Ready-To-Go Lysimeter is the ideal supplement to an existing weather station for direct measurements of the actual evapotranspiration. The aim of this simplified lysimeter station is to provide a solution for projects where large lysimeter stations are not suitable. Under consideration of the limited surface area and depth of the lysimeter vessel, Ready-To-Go Lysimeters are a less expensive solution to observe several different water transport processes. An EcoUnit is a measurement system to investigate ecosystem functions in the soil-plant-atmosphere system under defined boundary conditions. 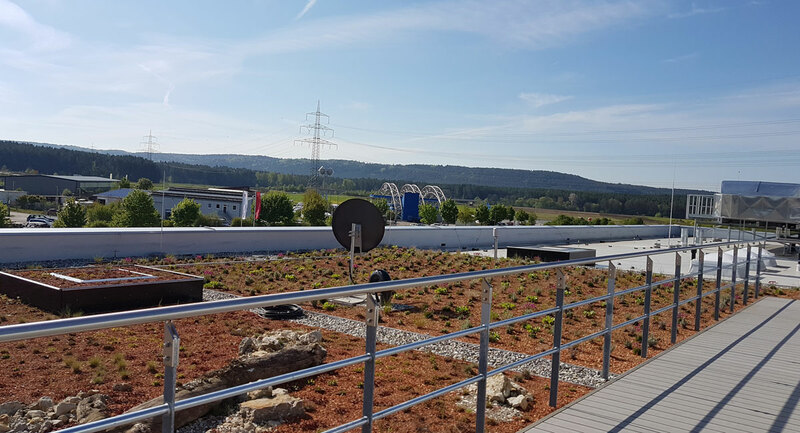 EcoUnits were developed for the iDiv-Ecotron research station by UGT GmbH and emc GmbH in collaboration with scientists and technicians of the German Center for Integrative Biodiversity Research (iDiv) Halle Jena-Leipzig and the Helmholtz Center for Environmental Research-UFZ. Ecotrons are used to investigate processes within the soil-plantatmosphere system as well as the interactions between the compartments. Ecotrons are lysimeter applications beyond the investigation of only soil processes and thus the generic term for lysimeter applications of all kinds. An EcoUnit consists of three units. The lower unit contains the soil, which can either be inserted directly into the container or in extra stainless steel cylinders (lysimeters). The latter allows the investigation of undisturbed soil monoliths. Up to four lysimeters can be installed in one EcoUnit. Several soil sensors can be installed in the lower unit to collect soil temperature, soil moisture and soil tension data. To investigate root systems and root growth rhizotrons can be installed as well. The lower unit is equipped with a system to collect seepage water and a system to control the temperature conditions at the lower boundary of the soil. On top of the lower unit a second unit is attached, which isolates the environment above the soil surface from the surrounding. The size of the isolated habitat is big enough for growing of medium shrubs. The second unit can be equipped with additional walls to divide the EcoUnit in four self contained sub units. On top of the second unit the upper unit is located, which contains equipment for irrigation, lighting and ventilation. The upper unit can also be equipped with sensors to collect data of temperature and humidity as well as with a gas analyzer. The lower and upper units are equipped with a control cabinet containing the required power supply and signal transformation as well as the measurement and control technology. The EcoUnit comes with a touch panel to visualize collected data and to control the EcoUnit. The equipment and design of the EcoUnits are always optimized for the customer-specific research goal. The rising claim of cities and townships to minimize the environmental impact of their traffic infrastructure enforces the inclusion of renaturation in planning and implementation of traffic routes. To prove the ecological and economical benefits of green spaces like parks, grass verges or the track bed naturation the hitherto existing qualitative valuations have to be backed up by exact measuring data. The Urban Track Lysimeter enables to estimate and optimize the water retention characteristics of different substrate and vegetation systems in track beds. These lysimeters monitor the storage, the infiltration and the evapotranspiration of precipitable water. Tensiometers determine the fraction of the water stored in the substrate layers that is available to plants. In addition to the water balance measurements it is possible to carry out quality measurements to record solute flows out of and into the urban track such as dripped down lubricants or fuels. The effect of naturation on the micro climat of the track bed is determined by recording the humidity, the temperature in the air and the temperature gradient in the track bed. Through this it is possible to prove the attenuation of heat emission from the track bed surface by heat deprivation due to evaporation. UGT has continuously developed lysimeter technology for 25 years. Our patents, which cover both the station itself and the sensors in the lysimeter, enable scientists in Europe and around the world to carry out their lysimeter experiments using state-of-the-art technology. Customized versions will be implemented on request. Lysimeter experiments have been carried out for more than 200 years for various questions. Since the first, simple lysimeter experiments, thy have always been further developed and applied to increasingly complex questions. Lysimeters consist of a soil column physically separated from the environment, with a known volume and cross-sectional area. The soil material can be disturbed into the column or can be taken in the form of an undisturbed soil monolith in the open air. 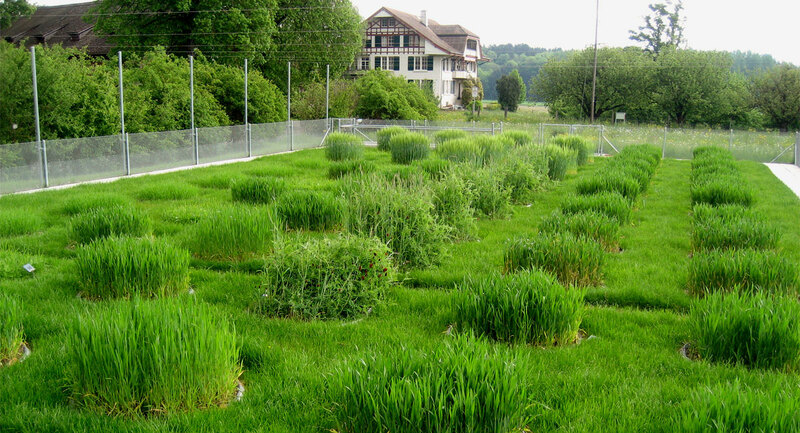 Lysimeters are used in the laboratory as well as in the open air (field lysimeter). Lysimeters are a suitable means for the detection of all water budget variables. 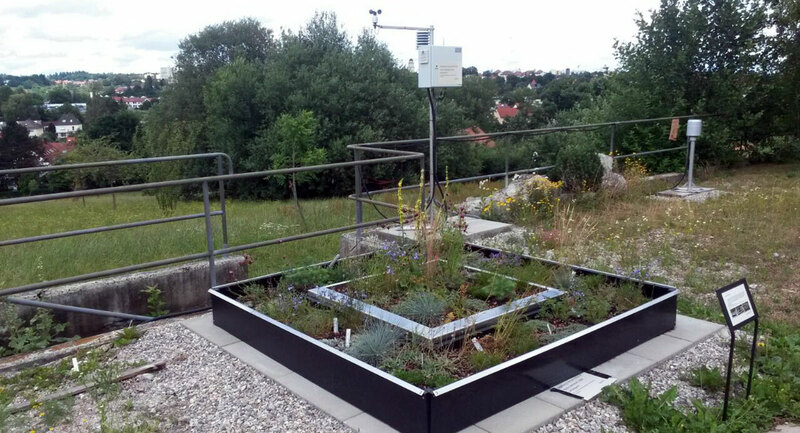 In combination with precipitation measurements, weighing lysimeters can be used to directly and reliably determine the evapotranspiration of the site via the weight change. Thus, lysimeters allow water balance studies of ecosystems, or can be used for studies of the plant water requirement of irrigation cultures. Moreover, lysimeters are equipped with a leach water detection system to enable a quantitative as well as qualitative analysis of leachate. 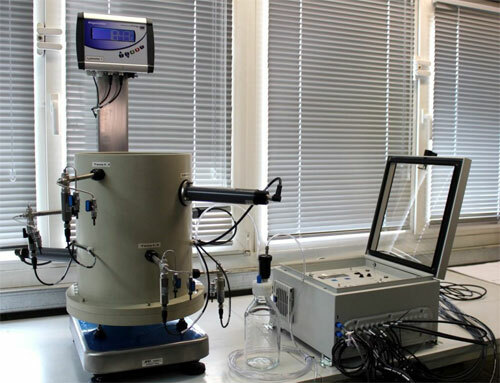 There are a number of advantages to studying soil processes under laboratory conditions: the con-trolled environment allows more precise experiments, the scale is adapted to several processes and permits shorter test times compared to field studies. Different materials can be integrated quickly. Laboratory lysimeters can be used to realise both monoliths and specifically filled columns. Column experiments on laboratory lysimeters lend themselves to the examination of physical soil parameters using multistep outflow or multistep flux experiments. These can also be used for measuring conservative or reactive transport. 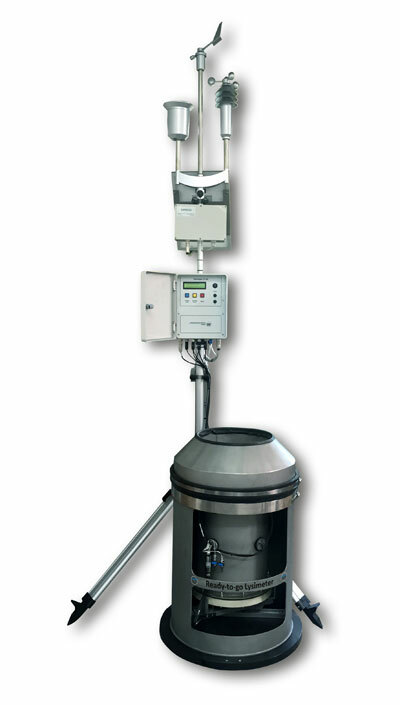 UGT GmbH offers laboratory lysimeters in a range of configurations. It is possible to control the boundary conditions using a suction base or overhead irrigation, as well as to configure measuring probes freely. Every lab lysimeter system is adapted specifically customized according to the planned project. download brochure: "UGT Laboratory Lysimeter"
The Moor Lysimeter enables the observation of the effects of the re-wetting of moorlands on the mobilization of phosphorus in soil as well as the quality of the surface water. By measuring lateral transport processes, the lysimeter enables the determination of parameters of the water and substance content of moor bogs with high temporal and spatial resolution. The groundwater level can be actively defined via a control system. 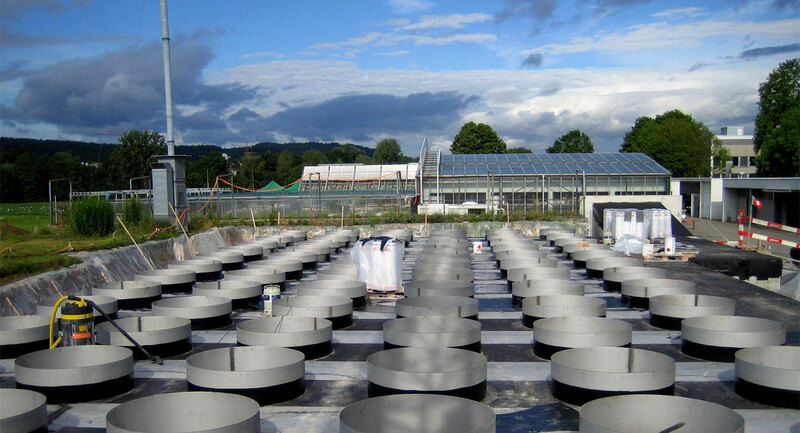 The Roof Lysimeter is a comprehensive analysis of the advantages of new roof greening systems. For large-area roofing plants, plants such as succulents and xerophytes are used, since they have a low growth height and require hardly any care. The roof lysimeter provides information on the water content of the roof greening. From this, conclusions can be drawn about the influence of greening on the runoff of the precipitation and thus of a possible discharge of the sewer system or on the influence on the energy balance of the building. With the snow lysimeter, the water equivalent of the accumulated snow cover can be exactly determined cover by using load cells without disturbing the snow. Thus in combination with SVADSS online visualization, a continuous recording of accumulation and ablation processes in the snow cover is possible. The resulting measurements can be used for flood protection management, avalanche risk assessment and water management. The entire construction is made of stainless steel and has been designed for years of use under the toughest conditions. The pan with the standard dimensions of 15 cm in depth and a surface area of 1m² (customer-specific adaptation both in depth and in size are possible) can be installed comparable to the surface of the surrounding soil. If a permanent power supply is available or a correspondingly dimensioned solar system, the melting water can be determined by means of a (heated) tipping bucket. Germann P. F., Prasuhn V. (2017) Viscous flow approach to rapid infiltration and drainage in a weighing lysimeter. Vadose Zone J. doi: 10.2136/vzj2017.01.0020. Perez-Priego O., Migliavacca M., El-Madany T. S., Carrara A., Moreno G., Kolle O., Reichstein M. (2016) Failure of correct evapotranspiration measurements by eddy covariance under certain conditions and energay balance closure in open-oak savanna ecosystems. Geophysical Research Abstracts Vol. 18, EGU2016-14823,2016. Podlasly, Christian & Schwärzel, Kai. (2013). Development of a Continuous Closed Pipe System for Controlling Soil Temperature at the Lower Boundary of Weighing Field Lysimeters. Soil Science Society of America Journal. 10.2136/sssaj2013.03.0113n. The anonymous data of the server log files are not associated with other personal data and separately, for technical reasons, stored for 4 weeks. All personal data will be treated in accordance with the law.